cheque (in asian and american pronounciation) or check (Europian pronounciation) is a financial form (document) to transect and convert money in to accounts or in to the cash. cheque system was found on the late 19th century and obligate by banking monomorscity. Cancel Checque Kya hai? Usko kaise banaye: Now days some peoples feels discomforts regarding the cancel cheque, so we provides some details about an cancel cheque in this article. How to Cancel a Cheque ?? Basically, A cancelled cheque is a cheque where cheque which has been with the word Cancelled written across on the cheque. also cancelled cheque in which has been crossed with two parallel lines at the right side of the cheque. now use of digital transaction like online transaction, e-banking, Online Shopping, Mobile Wallets they are use moreover. you do not have to write anything on the cheque that is the proof of individual maintains an account with the bank. why we need cancel the cheque, make sure that is not misused in any manner. with the few clicks online marketing and everything done under the booming of internet. Online Banking provides some facilities like Fixed deposits, Loans, Account maintains regarding that, so we can make live as easy way. we received some services from the bank until a manual intervention is provided. Cheque is a traditional fashion where we use paper documents before online banking. How to Create Cancel Cheque ??? 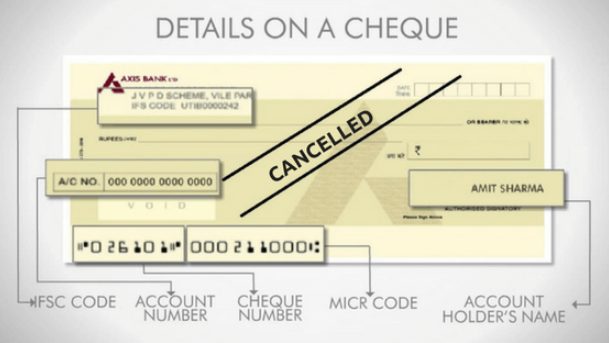 Now Days, Bank has not require a sign the cheque but some banks are require the sign on the cancelled cheque. when people issue cancelled cheque where it means they hold an account with the bank. You can issues the a cancelled cheque as anywhere, it is not compulsory need to issuing at the bank. when we transacting money by using online transaction facilities providing by bank that time necessity to cancel a cheque. Proof :- Proof according to your bank account with the appropriate bank where you claim to have bank account. This Information is on your passbook or cheque, by using this information of the account holder may fraudulent activities done. that type of fraudulent activities happened in the past. Hold Your cheque book : Hold your cheque book according to your bank account where we must have cheque facility. Two Parallel Lines on cancelled cheque : Basically two parallel lines draw across on a cheque by using Blue or Black pen. The two parallel lines draw like one end to another end on the cheque. Sign on a cancelled cheque : Cancelled cheque has been not require a sign on a cancelled cheque. if any case bank authorisation ask for sign on a cancelled cheque that time we must put sign on a cancelled cheque. also you can ask for written statement for why they need sign on a cancelled cheque. when you cancel a cheque then after that becomes useless and bank cant be transaction by using this cheque. Why Necessity to Written Statement??? Signature on a cheque is make use for criminal activities. so in other way you can say sign on cancelled cheque is risky for us. if someone ask for sign on cancelled cheque, that time must ask for the written statement for it. don’t take it lightly. whole reputed authorisation will be a fraud, we are not saying like that. we are talking about a person who is fraud and not be honest. also in other way we can say that person was relate with the fraudulent activities. if you have confirmed written statement regarding signature on cancelled cheque, you may take legal action against fraudster. Through Declaration or written statement, you may save from become victim of this type of fraud. that written statement or declaration document can use as your defence and also you can ask for compensation from the bank authorisation. 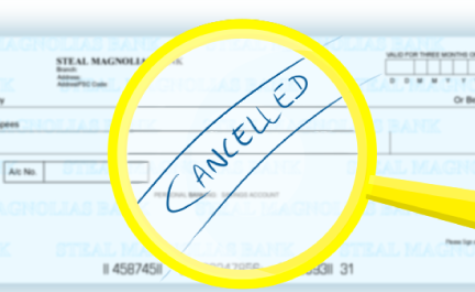 cancelled cheque is a method which is very reliable or no one can access your bank account without your permission. we advise to all the people please do not fix your sign on a cancelled cheque. if you fixed your sign, it might easier for the fraudster. Where a cancelled cheque is used ??? When you opening a bank account :- When you are opening your new account in a any bank that time bank organisation ask for cancelled cheque for savings account and current account of the bank. When you opening demat account :- Demat account where you can save or invest your money as an stocks. For open the demat account you will have to fill up the form and attached with some documents like ID proof, cancelled cheque and that will send to stock brokerage firm. demat account provides auto debit and auto credit facilities. mostly your savings account link up with the demat account and all money transaction can be electronically between the two accounts. For Loan :- You can get loan for Marriage, Home and any other personal use from the bank. Now technology is forward company cant give you a loan as a cash amount, it gives as a cheque or directly transfer to the your bank account. For your personal loan cancelled cheque is required. For EMI Payments :- EMI payments stands for pay off later in smaller instalments like Home Loans, Purchasing TV or any electronic items etc. EMI amount will be directly debited from your bank account. For EPF Withdraw :- Full form of EPF is Employees Provident Fund. The EPF method is stand for make premature withdrawal. for EPF withdrawal we need to submit cancelled cheque. EPF amount will be directly debited from your bank account. For ECS Collection :- Full form of ECS is Electronic Clearance System. ECS method stands for investment company debits money from your bank account directly on a specified date every month or every quarter or half yearly or yearly. By using ECS you may pay your all bills like Electricity bill, Water Bill, Internet Bill etc. by using cancelled cheque investment company deduct money from your bank account. For KYC Document :- The KYC is stand for know your customer document and the person who are involved in some kind of financial activities. Bank ask for the KYC document for the person details. For insurance policy :- Insurance Policy is stands for moneyback, endowment, term, health etc. you have to provide cancelled cheque for the insurance policy. if you have savings account that time for the insurance the premium amounts will be debited directly from your savings account and The maturity amount will get auto credited to your account. Cancelled cheque has lots of uses and also misuses. must take care about an hand over the cancelled cheque to the reliable company or person. Now days mostly people knows about an cancelled cheque necessity but unfortunately, many of us are not fully aware of its uses and its importance. so we provides all the important information of a cancelled cheque in this article. A person who has already knows about an cancelled cheque, he or she gets more information from this article and other can knows all about an cancelled cheque.